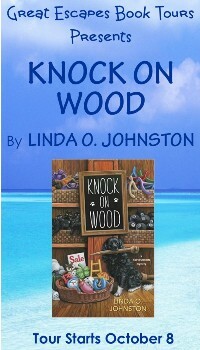 KNOCK ON WOOD is a well written mystery with a great plot that was more than it seemed. Every time I was sure I knew the answers to who and why, something would happen causing me to doubt myself. I didn’t have a clue as to who the murderer was and it was quite a surprise when he/she was revealed. I never saw that one coming! Johnston combines her love of animals with an exploration of interesting superstitions in this enjoyable series. Whether you are so superstitious you surround yourself with bubble wrap every time you have to leave the house on the 3rd Thursday after a full moon (no, that’s not a real superstition) or on the other end of the spectrum and so skeptical you snicker at people who purposely step over the cracks in a sidewalk, you will find a day or a weekend in Destiny to be a welcome respite from your ‘regular’ life. Of course the writing in this novel was superb with many twists and turns. I liked the relationships in this novel also. This one had me guessing till the end, which is what I like about a cozy mystery. The characters are likable and written with emotion and depth. The mysteries are engaging and the author tosses in a few red herrings to help disguise the true suspect(s). The mystery is very well written and keeps the reader guessing as to whodunit until the final reveal. This is a clever story with realistic and well-developed characters. The mystery keeps readers guessing. I like Ms. Johnston’s voice – her writing style. The story flows well and the mystery kept me guessing: two things I believe are essential to a good cozy mystery. This book had everything you expect from Linda Johnston murder, adventure, great characters and so much more if you haven’t read this series you are missing out on so much!! Rory Chasen, now the manager of the Lucky Dog Boutique in Destiny, California, is delighted when her closest friend Gemma Grayfield, a librarian, comes for a visit. But Gemma arrives early and seems upset. It turns out she has broken up with her boyfriend, Frank Shorester. Gemma is soon hired to manage the Broken Mirror Bookstore. Frank follows her to Destiny, where Gemma is also wooed by two local men. Rory may be a little jealous—until one of those men, Deputy Mayor Bevin Dermot, turns up dead. Bevin is known for knocking on wood for everything, but despite Destiny being all about superstitions that did not save his life. Rory tries to help Gemma clear herself of being a murder suspect, even counting on her lucky black and white dog Pluckie to help. But is Gemma guilty of murder—or of just having a run of bad luck? Linda O. Johnston’s first published fiction appeared in Ellery Queen’s Mystery Magazine and won the Robert L. Fish Memorial Award for Best First Mystery Short Story of the year. 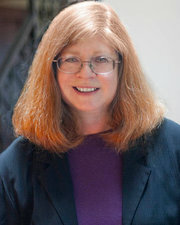 Since then, Linda, a former lawyer who is now a full-time writer, has published more short stories, novellas, and 38 romance and mystery novels, including the Pet Rescue Mystery Series , a spinoff from her Kendra Ballantyne, Pet-Sitter mysteries for Berkley Prime Crime, and Harlequin Romantic Suspense as well as the Alpha Force paranormal romance miniseries for Harlequin Nocturne. She additionally writes the Superstition Mysteries for Midnight Ink. 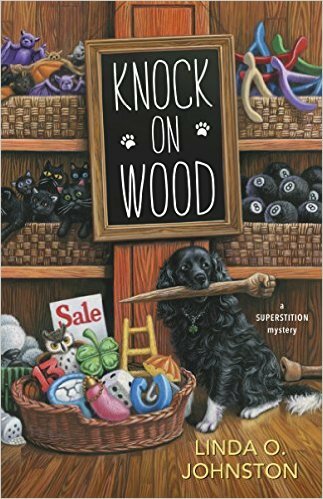 Her latest cozy mystery series, the Barkery and Biscuits Mysteries also from Midnight Ink, started off in May with BITE THE BISCUIT and KNOCK ON WOOD comes out October 8.